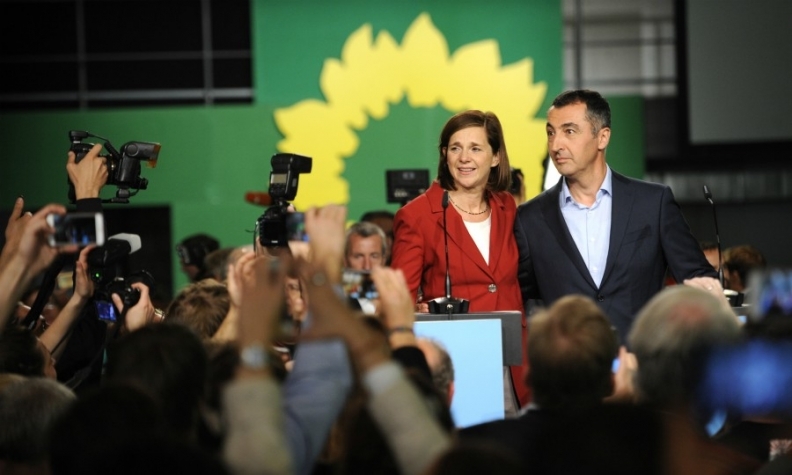 Senior members of the Green party in Germany, Cem Ozdemir (right) and Katrin Goering Eckardt, attend an election night event on Sunday in Berlin. FRANKFURT -- The emergence of the Greens as likely powerbrokers in a future German government coalition could spell bad news for the country's car and coal power industries. Talks on such a coalition would be highly complex, but could see the Greens pressing their key policies on the energy and auto sectors, which are already grappling with Germany's shift away from nuclear power and a diesel emissions scandal. Among their policies, the Greens want to ban the sale of new combustion-engine cars starting in 2030 - a decade earlier than plans already outlined in France and Britain - to cut pollution levels as the sector moves towards electric vehicles. "With regard to the diesel question the FDP and CDU and even parts of the Greens will be opposed to severe intervention," said Hanns Koenig of Aurora Energy Research, a Britain-based consultancy to utilities, investors and political decision-makers. "With coal, the situation is different and there is much that speaks in favor of a Green position." Analysts at Jefferies were skeptical coal plants could be phased out as quickly as desired by the Greens, saying the 2030 deadline would withdraw capacity currently providing about half of the country's total electricity generation. "Even if we assume that half of the market share gap is filled by the existing gas capacity in such a scenario, Germany will have to build an additional 130 GW of renewables to balance the market," they wrote in a research note. "We struggle to add the maths in such a scenario." Separately, Volkswagen Group CEO Matthias Mueller, spoke of his shock that the "populist, right-wing, xenophobic" Alternative for Germany (AfD) party scored so highly in the election. "Germany has been politically and economically successful because we are a tolerant, cosmopolitan and internationally-minded country," Mueller said in a statement. "This is something we must keep on fighting for." AfD is now the German parliament's third-largest party.